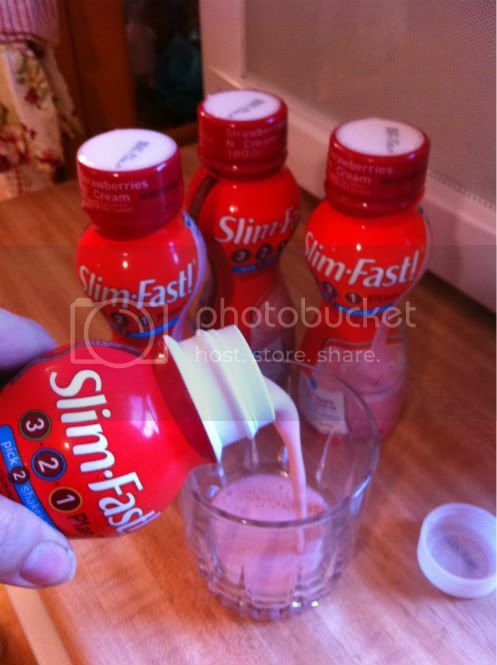 Using Slim-Fast Meal Replacement Shakes To Stay on Track the Holidays! A few weeks ago, I began stocking my fridge with the new Slim-Fast shakes that recently began hitting the shelves – it’s a great new formula, producing the richest, creamiest, best-tasting Slim-Fast shakes ever! I have lost 20 pounds with the help of Slim-Fast in the past, and I am already seeing a difference in the scale in the past month since I began dieting again! For those that don’t know about the Slim-Fast plan, let me break it down for you, because it is really quite simple and easy to follow! Slim-Fast 3*2*1: three healthy, you simply pick 100 calorie Slim-Fast snacks a day, or nuts, fruits or veggies, then choose any two Slim-Fast shakes or meal bars in place of two of your meals, and have one sensible 500 calorie meal. There are so many Slim-Fast options available! While I am not doing the 3*2*1 plan myself at the moment, I am actually using Slim-Fast shakes as a replacement for my breakfast, and my daughter drinks them when she is rushing in the morning and is running late for her school bus. At 190 calories for her favorite, the Creamy Milk Chocolate, it’s a healthier option than grabbing a bagel with cream cheese, and Slim-Fast’s new bottles are perfect for drinking on the go! Slim-Fast offers great 180 and 190 calorie shake flavors like Creamy Milk Chocolate, Strawberries and Cream, Cappuccino Delight, Rich Chocolate Royal and French Vanilla! The Slim-Fast meal bar and snack bar options are equally great-tasting and healthy, with flavors like Chocolate Mint, Chocolatey Vanilla Blitz and Peanut Butter Crunch! During the holiday season, I know that we all want to spend time with friends and family and indulge in all of the goodness that Christmas dinner has to offer…that is totally possible when you replace your breakfast and lunch with a Slim-Fast meal replacement shake or bar. Simply use Slim-Fast as healthy options during the day and enjoy a small portion of your fabulous holiday dinner! You can buy Slim-Fast products on Amazon.com, Wal-Mart, Target, Safeway, and grocery stores nationwide. Check out Slim-Fast on Facebook for great tips from Slim-Fast and Slim-Fast users!